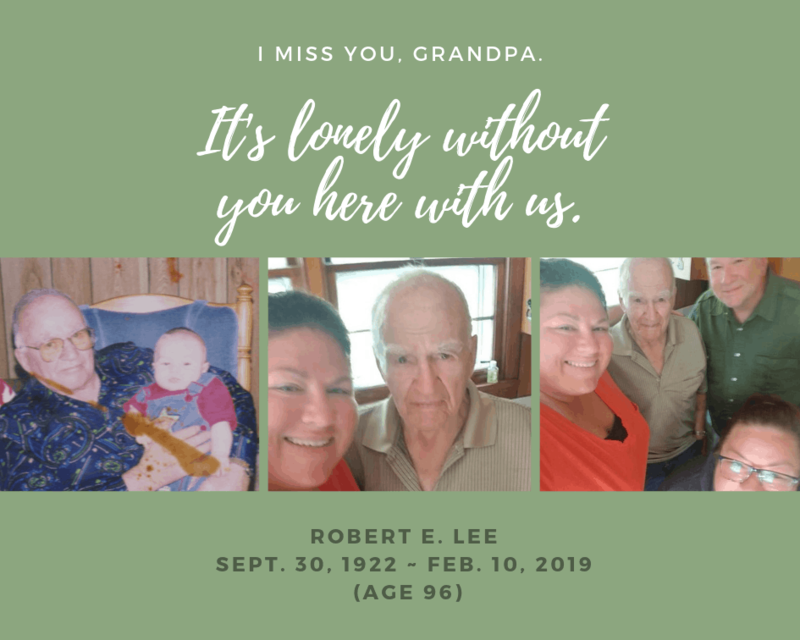 For one week I struggled through emotions of knowing my grandpa was sick. What they thought was a bleeding ulcer quickly turned into what they found to be stage four stomach cancer. Even at 96 and during that last week, my grandpa was still a stubborn old man (somehow that brings me comfort – knowing that even at the end of his life, he was still that stubborn old man I knew and grew to love more and more over the years) making his own decisions… even checking himself out of a Florida hospital, against doctor’s orders, to make the long 22 hour trip back to Michigan, where he wanted to spend his last days. And even though I knew the end was near…I wasn’t ready when the call came in that chilly Sunday night. I was going to be home in a week, why couldn’t he have hung on just a little longer. The timing was all wrong. It’s never easy to say goodbye to someone you love, but how do you actually say goodbye to someone you didn’t get the chance to say it to??? Guilt for not getting back to Michigan in time to be by his bedside. Guilt I didn’t call, even once, in 5 months since I moved out West. Guilt I didn’t spend more time visiting him when I was still in Michigan. Some have told me guilt is part of the grieving process. Others have said to just let myself feel the guilt. Others have said there’s no reason to feel guilty at all… and I think they’re all right. I think it’s just a part of the process I’m going through. As I go through old pictures, I find comfort in looking back on all the memories and how full of life my grandpa was. 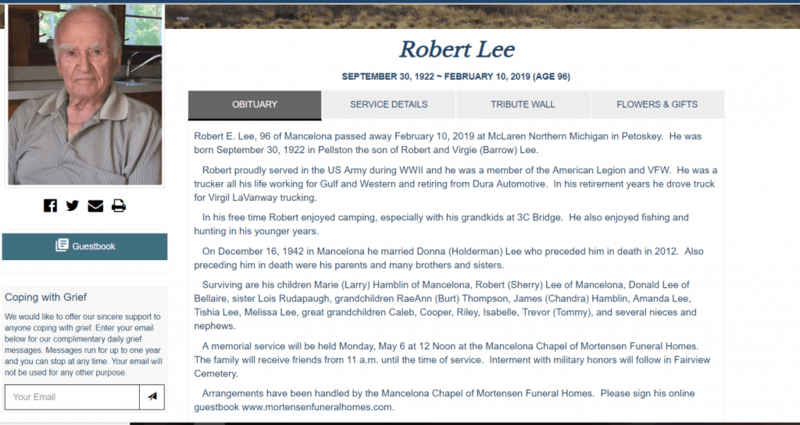 He really did live a long, fulfilling life. 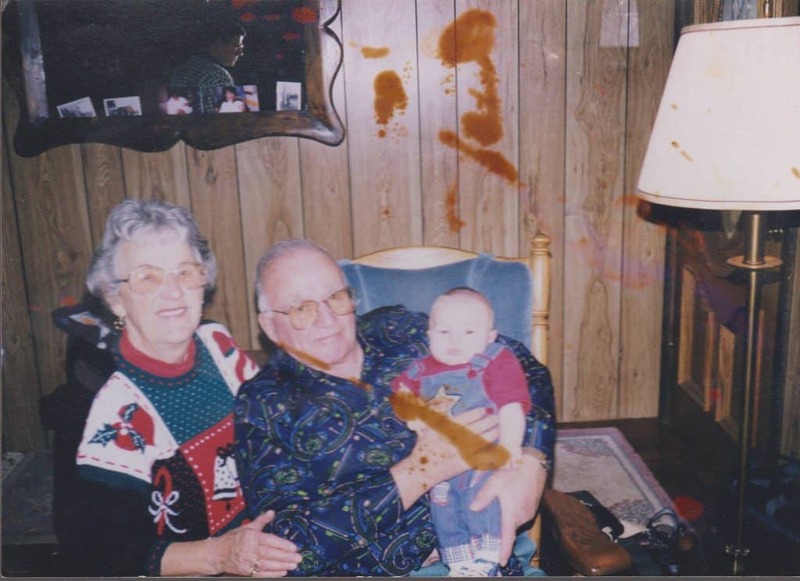 Here’s one of my all time favorite pictures of not only my grandpa, but my grandma too and my son who was so little back then! Grief is such a weird thing. Trying to do normal today and it’s just not happening. Went back to bed this morning, after not sleeping much last night and a massive headache from crying so much…slept until 10:30! Checked email but didn’t actually “see” what any of the emails were. Decided to make myself get out and go to the grocery store…only to break down crying talking to my dad. Thankfully passerbys let me have my moment as I looked at hamburger and pretended nothing was wrong. Got out of the grocery store, couldn’t remember where I parked only to find my car and realize I walked passed it THREE times and didn’t notice it until I hit the unlock button that last time and was greeted with the flashing lights as it unlocked. Anyway, it’s not often someone gets to live until 96 years old but my grandpa did and he was able to make all the decisions up until the very end. I’d like to think that’s a “gift” to get to the end of your life and still be ‘well’ enough and lucid enough to call the shots! RIP Grandpa, you’ve left a big hole in my heart but an even bigger smile on my face that I was the lucky one to get YOU as my grandpa!